We were delighted to take part in the Ageing Better Cultural Showcase on 21 March at the Royal Court, coordinated by Collective Encounters. The event was designed as a fringe event to the UK Network of Age-Friendly Communities conference which took place the previous day at The Bluecoat, on School Lane. 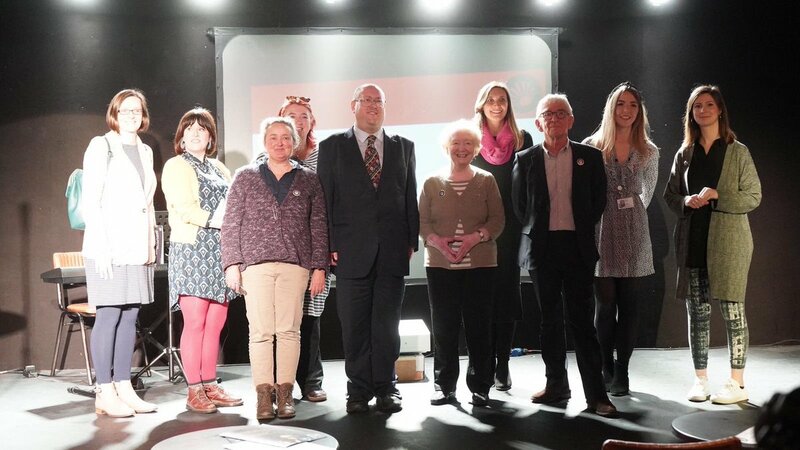 The cultural fringe event at the Royal Court was an opportunity for Liverpool to showcase the role culture plays in making Liverpool and age-friendly city. The morning was opened by Jeremy Wolfson, Mayoral Lead for Older People, who spoke about the great work going on across Liverpool for older people. We shared information about the HOP network and invited people to become members, and our National Museums Liverpool colleague Sam Vaux presented on the House of Memories programme. The morning was bursting with exciting examples of work from Open Eye Gallery, The Royal Court, Collective Encounters, Travelled Companions, and FACT. We particularly enjoyed the Royal Court Choir who gave an uplifting and energetic performance! Thank you to everyone who came along to the event, and to Collective Encounters for organising.